Shenzhen DBK Electronics Co., Ltd.
5. Owning cell factory and daily capacity is 20,000Ah Shenzhen DBK Electronics Co,.Ltd, which was established in August 2004, is a high-tech enterprise incorporating R&D production and sales of powerbank, chargers, HUB,cable etc. 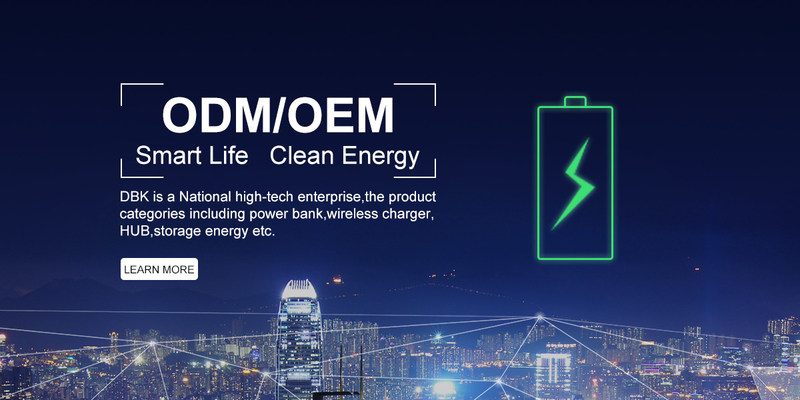 Our products include solar power bank, laptop power bank, wireless charging powerbank, quik charge power bank, wireless charger, quick charge charger, PD2.0 power bank, PD2.0 charger, PD2.0 HUB which involve in many fields such as IT, telecommunications, digital electronics, consumer electronics,etc. At present, DBK owns a new industrial area of nearly 20,000 square meters, more than 3,000 employees and monthly production capacity of over 15 million sets. In addition, our company brings in advanced technology and production equipment, sets up a professional quality control team of over 100 members, and has a professional quality inspection control system capable of providing high-quality products, excellent service with timely delivery. Besides, we also have a R&D engineering team with over 300 people who research and develop new products independently. Each professional project engineer guides and follows up the whole product procedures from mold design, circuit design, structrue design to final performance assessment, sampling and mass production. "Be loyal to company, sincere to customer and honest to colleague" is the enterprise tenet of DBK, and take technological innovation as its basis. We adhere to the business concept of "Innovation First, Quality First and Customer First" to meet customers' requirements at most with our best products and services all the time. Button cell battery for Watch,Key,Calculator, etc.